Christmas is over and the new year is well underway, but I’m still diggin’ the spirit-lifting spurts of bright red around the house. Even though snow has mercifully dodged us thus far, it is January so the trees are bare and the feel of winter definitely abounds. I was sick (yes, again!) last week and spent a lot of time staring out the window planning my escape. I saw the most beautiful cardinal perched on a low-hanging branch for what seemed like an eternity and a fleeting moment all in one. She was a striking creature in her shockingly red coat and heavy-handed eyeliner. She brightened an otherwise dreary winter’s day with her brilliant color and gave me inspiration for a winter tablescape. The contemporary lines of J.A. Henckels “Bellaserra” stainless works well with the setting. 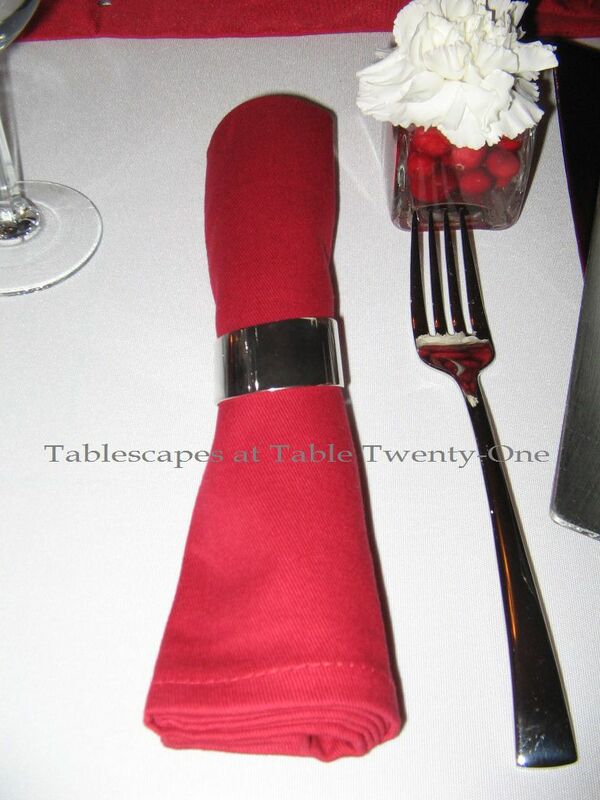 The slender tube-like fold of a red cotton napkin is secured with a silver napkin ring. 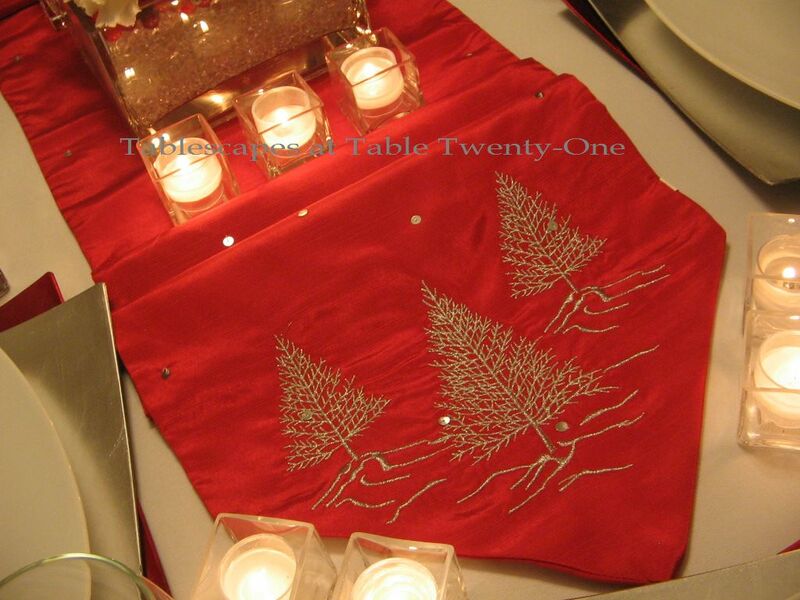 Another shot of red revs up the stark white linen via the TJ Maxx table runner. I double-folded the center part back to lend more of a 3-D look with just the decorated ends exposed. 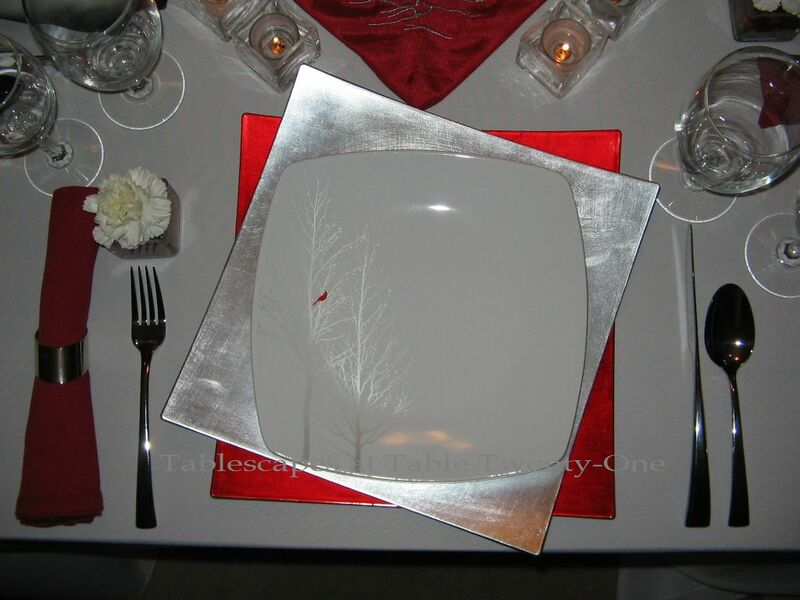 The barren silver trees on the runner are a nice companion to those on the plates, and it could just as easily find its way into a Christmas tablescape. The buffet behind the dining table gets an austere, yet somewhat theatrical treatment. 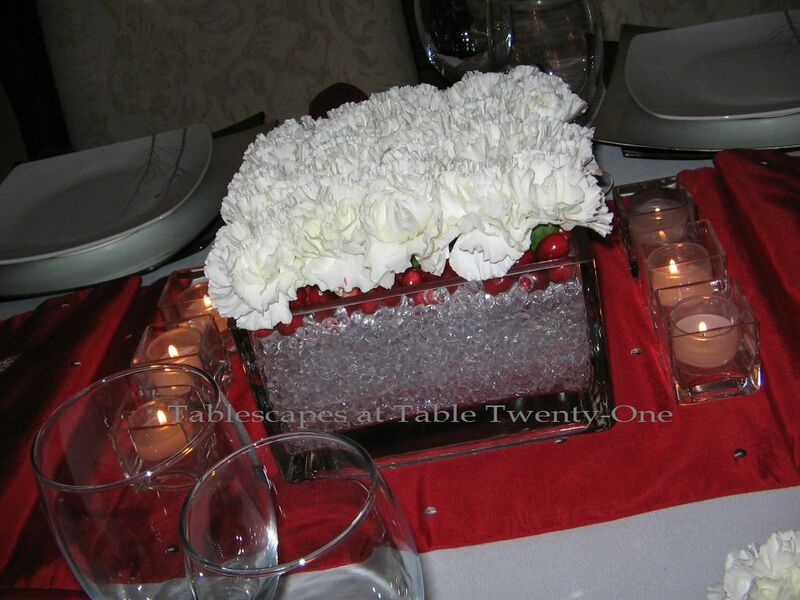 A square glass floral container filled with more acrylic “ice” chips holds dramatically arched branches coated in silver paint. Peering from within is a lone cardinal. Another glass container is filled with fresh cranberries for the requisite shot of color. Votive candles dance the length of the buffet. 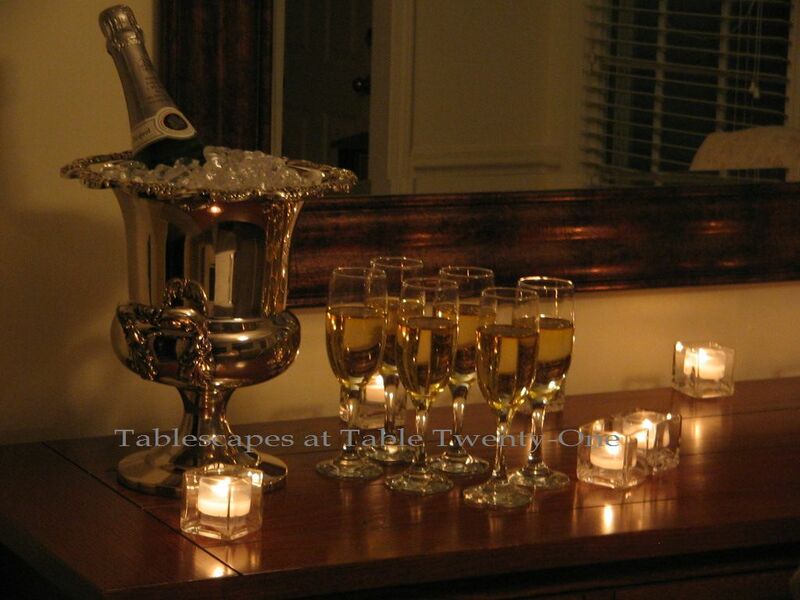 I am thrilled to join my fellow tablescapers as we start this new year together at Susan’s Tablescape Thursday. Come along this Thursday, won’t you? Oh Alycia!! Fabulous! I looked at those plates several times. LOVE that little red cardinal. I have never actually seen a real live cardinal. They are so beautiful! The double chargers are so creative! I can see it would be good to have a supply of those little votive holders/vases on hand. How versatile they are! Way to go girl…you are awesome! Happy New Year! You took that theme and ran with it!! Very beautiful and I will be using the planning my escape line real soon. I also love the 3D effect with the runner. Don’t know if I have the willpower to go into TJ Maxx right now so I will live vicariously through your purchases. Alycia, I adore the red cardinal plates, as you know I have some too. Just PERFECT for a day like today, when the snow is coming down in BUCKETS…we’ve got 7-8″ already with more to come! The cardinal is Ohio’s state bird & I just ♥♥♥ the pretty bright male ones. Sad that the girls aren’t as flashy. Everything about this table speaks of winter & icey, cold conditions…the bare tree branches, the stark whites of the table & plates, & even that “acrylic ice”. Do explain more about it & where it could be purchased, please? Is it crinkle cuts of shiny paper? I can’t tell from the photos. I tried using plastic bags down inside a vase once for a similar effect. It failed. I know you are going to be a GREAT teacher in March!! Good Luck with that! Be sure to bring your laptop &/or a projector so you can show off some of your tables to inspire the students like you do us. I was so hoping you were feeling good again, darn! That stinks, you have definitely had more than your share of illness. Hope you are feeling better by now. I adore the red and white!!!! That china almost came home with me too, but I am trying my best to refrain from buying for a while (we’ll see how long that lasts). You know the cardinal is the Virginia state bird, so this is a very special design for me!! I agree with hubby, the “layer cake” looks divine!! I also love what you did with the chargers. Very contemporary and modern. How cute that the lone cardinal is in the vase on the sideboard sort of “matching” the china design!! So clever!! One of these days I am going to do a Virginia table, so I’ll be using the cardinal in some way. Maybe I could borrow your dishes…. As a bird watcher, and a lover of the Cardinal’s bright red against the white snow as I gaze out my kitchen window – I JUST LOVE THOSE PLATES! The Cardinal on that bare white branch is a winner too. AS ALWAYS, YOUR IMAGINATION, ABILITY TO TAKE AN IDEA AND CREATE A CONCEPT IS TRULY A GIFT. Such a beautiful table! Sorry you have been sick again, hopefully now that you have been sick you’ll be healthy the rest of the winter. There is not any snow to be found here but let me tell you it’s COLD! I hope the snow stays up north and our warm southern temps come back soon! I love those dishes and how you doubled the chargers and turned one at an angle…so clever. I had my eye on some square chargers the other day and talked myself out of them since I do not have any square plates…might just have to go and get both 🙂 I laughed yesterday as I was packing away my Christmas dishes, I was arranging them in the cabinet and making room for my new dishes and was able to get them all in and still have room left over…I turned to Scott and said “Look, I just made room for more dishes!” I turned and held my hand up to give him a “High 5” and he left me hanging…just shook his head! Ha…I then reminded him he did just build more shelves in his garage to store more tools, so he can’t talk. Thanks for sharing your beautiful table. You are always a source of great creativity and inspiration. Have a great week! I NEED those cardinal plates to go with my cardinal ornament tree! I found two more ornaments at Cracker Barrel on a potty pit stop last week. I think you need THESE little gems to go with your Santa hat chair covers, AND they’re on clearance. What a great inspiration you are, I will look at dishes with a new eye other than saying oh that’s cute or nice, and probably start picking up some items (if a great sale) who am I kidding, I need to get rid of stuff now, but I do enjoy seeing your work. Go Girl!!! How beautiful ! Love it ! Well, THAT didn’t come out too well!!! I meant to say “another home run, girlie!!! !” Duh! I’m back! Your inspiration from the cardinal was perfect! 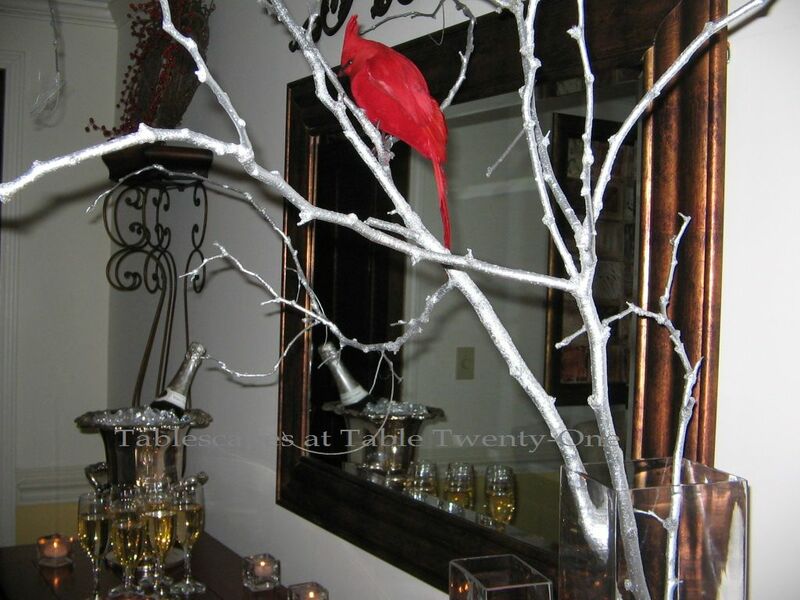 I love the silver painted branch with the lone cardinal…just how it is naturally! Your double chargers with the plate are so smart! Love that whipped cream center piece!! LOL… I also thought of food when I saw it! Hmm…does that tell you something about me?? I have cardinals visiting now at the feeders and it’s always a joy to see them against the “stark” white background of our new fallen snow. Get yourself some vitamin C with rose hips and boost that immune system! Sorry you got sick, but I trust you are better now. Whats with the sickness going around here????? Hope you are better! Dont you just love 222 Fifth? Anything they do with birds is just FAB!!!! The silver on the trees is wonderful, which TJ MAXX do you like best? I’ve found the most deals at the outlet at the Legends. That table runner is so perfect!!! Love this table!!! YOU ROCK, MISSY!!!!! 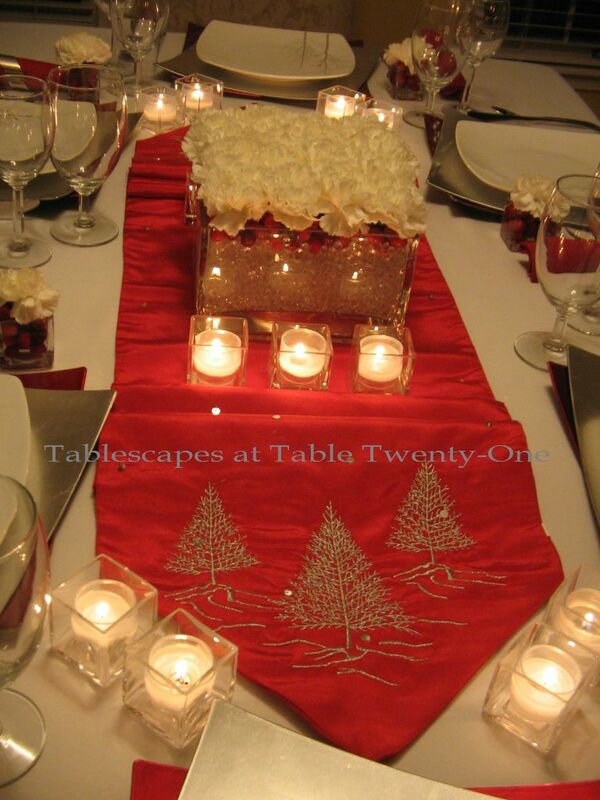 Gorgeous winter table Alycia! I saw those plates at HomeGoods and didn’t get them. I was really tempted and now wish I had brought them home. They are wonderful! LOVE those plates! They are so subtle yet so striking at the same time. Your pops of cardinal red are just perfect, and the “twisted” double chargers is the absolutely PERFECT choice. I sure hope playing in the dishes made you feel better! Alycia, looked at this earlier and didn’t leave a comment cause I was at work – frown.. but i loved seeing it this evening. So many cute details. Love the cake centerpiece.. it’s amazing.. really. Carnation frosting!! and then the cardinal on the branches – stroke of genius.. Love the plates and the double chargers too. 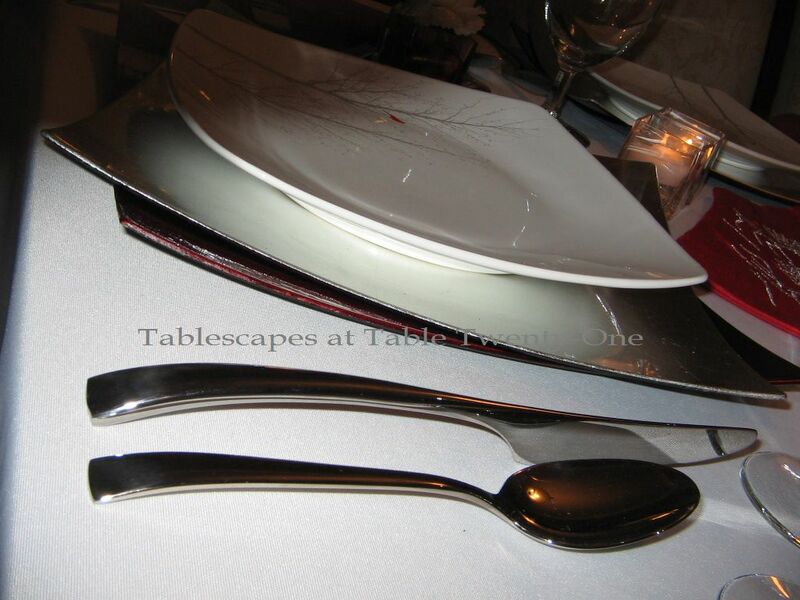 Great winter table.. xo marlis – hope you are better. Oh, honey….I am SO SORRY you have been sick again!!! I’ll keep you and your health in my prayers!!!! 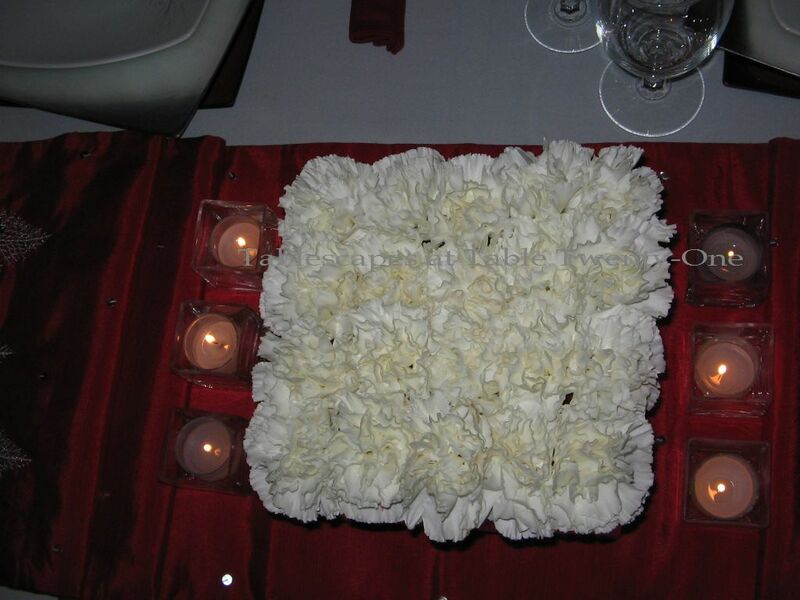 I want you to know that not only is your tablescape stunning (and I’ve never seen carnations looks as amazing and elegant as in this tablescape), but the way you described it….from the inspiration to bringing to idea to fruition….is absolutely fabulous, too!!! Great descriptions!!! The precious, tiny little red cardinal does really pop against the white! Oh I love this too! I have a special place in my heart for cardinals. It seems like every house I’ve lived in has a red bird family nearby. I love seeing them perched on a stark branch…such beauty. The cranberries make a stunning effect and I do love red:) happy new year! I hope you stay healthy! Oh…cardinals…I LOVE them too. Your dishes are just beautiful! Love the red and white scheme. Hope you are feeling 100% soon! Such a creative table! I’m learning so much from you! I hope you are feeling better. What a beautiful table! I love the modern feel, and the little individual floral arrangements are charming! I love the large one, too — and I’m with your husband, expecting cake after dinner! Fabulous table! I love the cardinal plates, what a wonderful find. And your floral arrangements are gorgeous. Hope you are feeling better soon. Wonderful post. Happy New Year to the whole bunch. Wow… your dinner plates is one of a kind. I love the detail (bird) on it? So, elegant. Hope you had a great NY… & have a fruitful 2012. Love those pops of red — just like cardinals in the snow. Such pretty dishes. This is a beautiful winter’s table. Wishing you a wonderful 2012! Red is good no matter the season. Wow, you are going to teach others how to do wonderful tables. I like that and know that you have so much to share. If I were closer, I’d have my name at the top of the list. Happy New Year to you! I’m so sorry you’ve been sick again, and I really hope you’re on the mend. 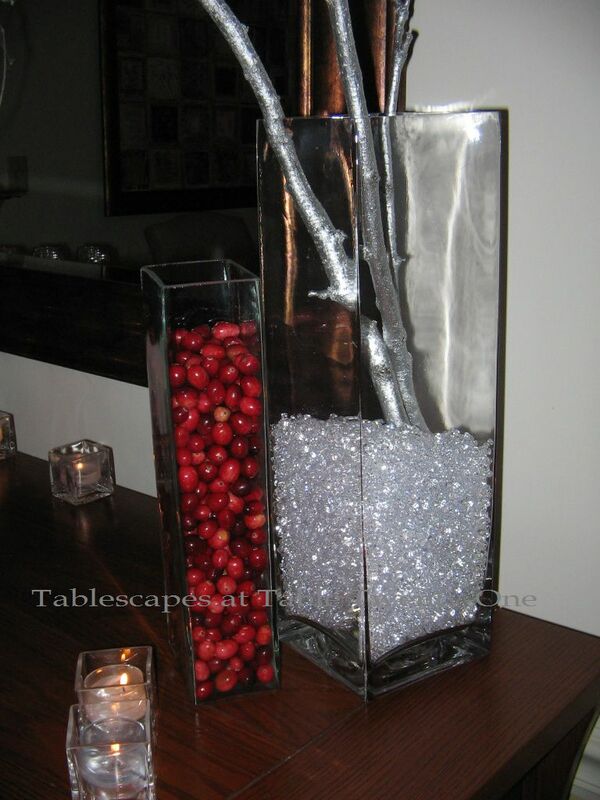 This is a GREAT winter tablescape! I really, really love the plates with the tiny red cardinal. That tiny bit of red just draws the eye in. 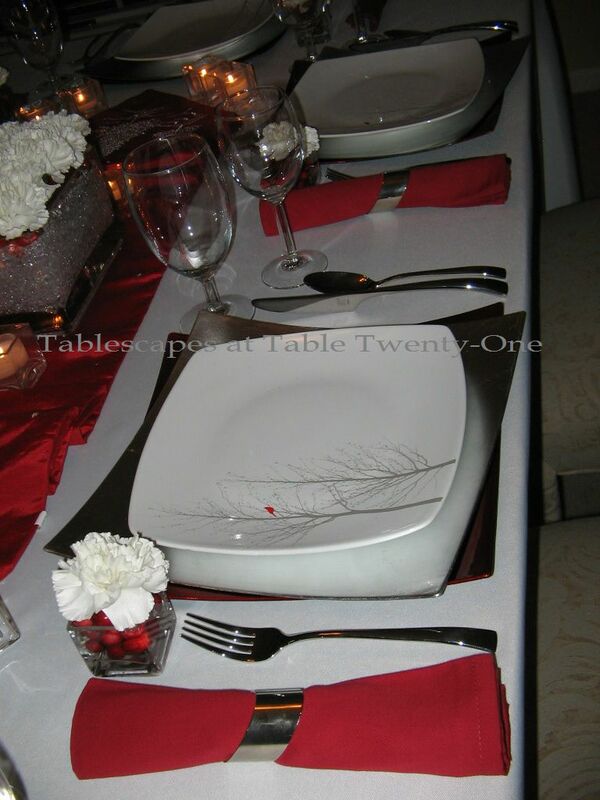 The plates coordinate beautifully with the red table runner. And I have to confess that I do LOVE the look of naked tree branches in the winter. They look so lacey spread against the sky. I’m just a four seasons kind of gal. I couldn’t stand to live somewhere that didn’t have four separate seasons. You take care of yourself and feel better soon! Wow! Your blog is a table styling gold mine! You are so talented at this. The colors in the dishes are so peaceful and beautiful. 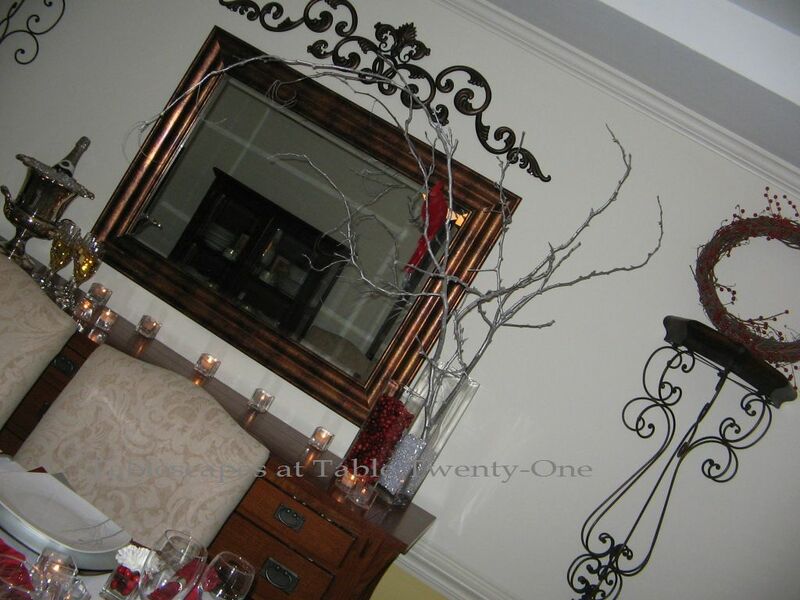 My favorite part is the floral centerpiece…just LOVE it! TWEET! I mean sweet! Love those plates, and I thought it was a cake when I first looked too! Wintery, but the red def warms it up! Very pretty! I hope you are fully recovered! This is fabulous. I love cardinals and did a table with them myself just this weekend which I will post soon. I love the use of two chargers, such a great idea as is the votive with the cranberries and carnation. You are such a clever lady! Thanks for the kind comments on my post and I apologize about breaking the rules and not flying you in to taste test, but it was all delicious! How about if we exchange flights and you fly me in for your tablescaping class??? I actually signed up for one in Nashville offered by Terry White, but I’ll bet it won’t be as wonderful as your’s. I looked up Michael Ontkean and I can see the similarity with this picture. Have a great week. 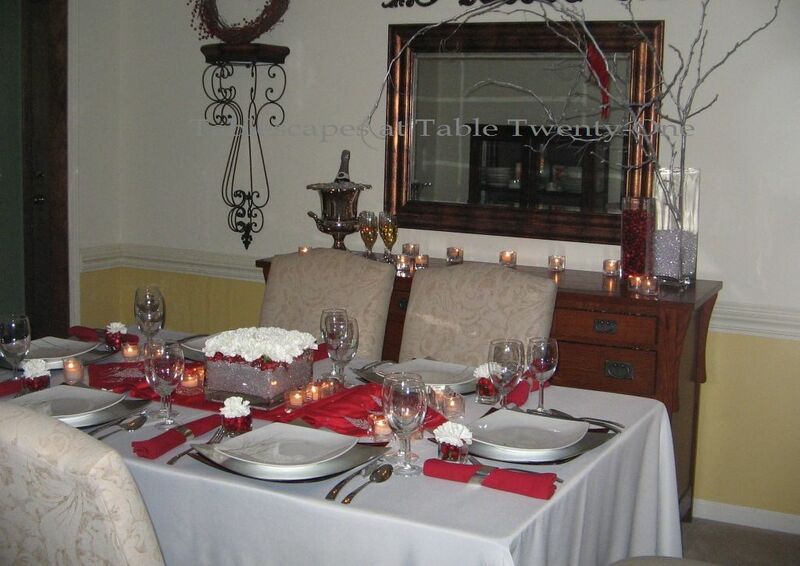 You are just so creative when it comes to tablescapes, Alycia! 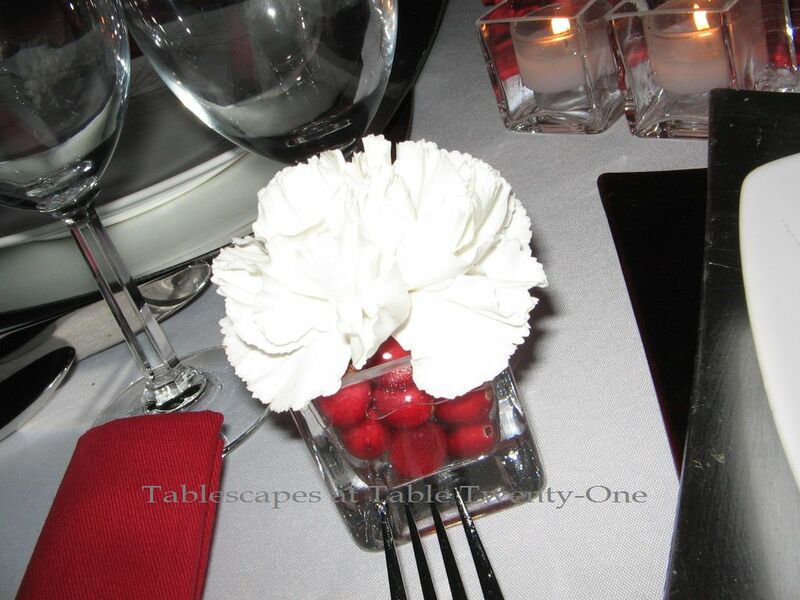 I love this one–the cardinal plates are just lovely, and I want to try your idea with the cranberries in the glass and the white carnation–what a cool way to hold the flowers in place–very smart! Always a pleasure to hear from you, and glad you enjoyed the wreath and door hanger! Loving this table as well, Ms Alycia!!! I love the cranberries with the white carnations! And I LOVE those cardinal plates too! You have just a beautiful collection, and everything is so nicely put together! !